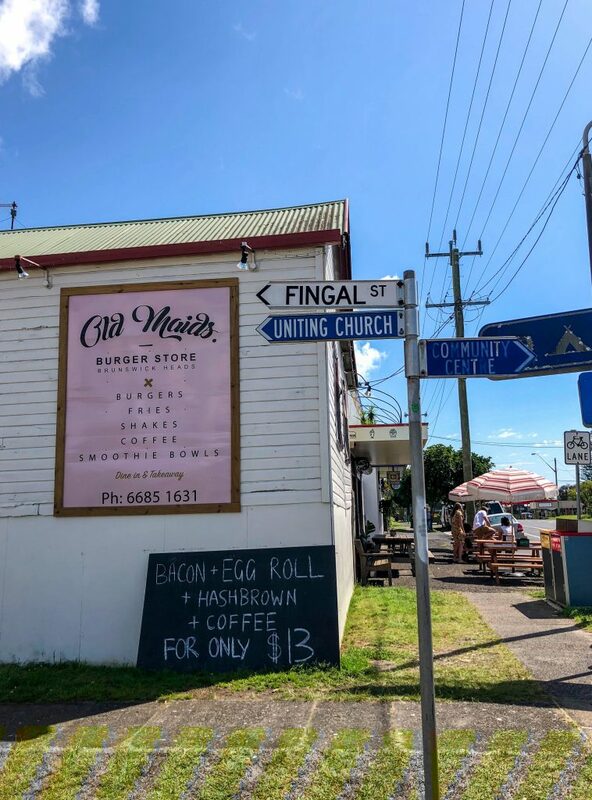 As the weather gets warmer and the daylight gets longer we are drawn to spend more time in beautiful Brunswick Heads. When visiting ‘Bruns’ it’s too easy to slip into beach holiday mode. There seems to be more sky and a slower pace. 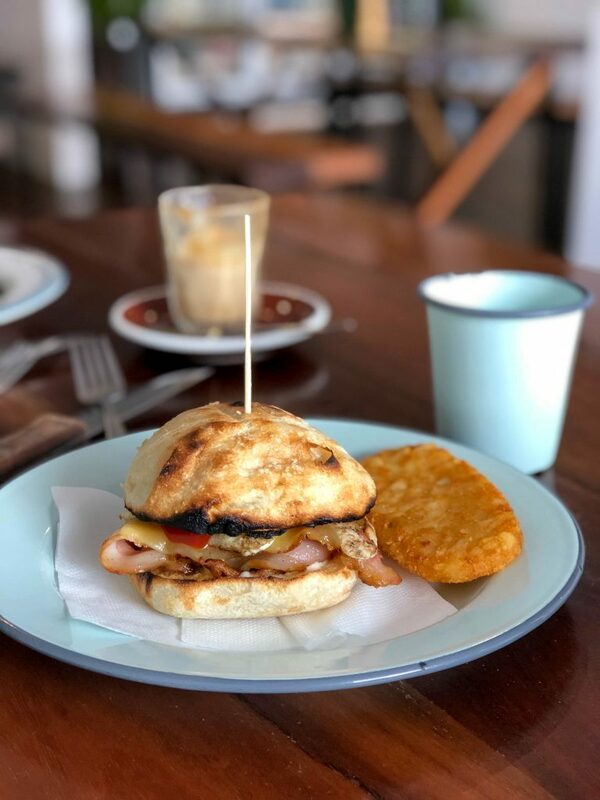 And in true beach holiday style, Old Maids Burger Store is the perfect place for a leisurely refuel after a salty morning in the surf or an afternoon by the river. 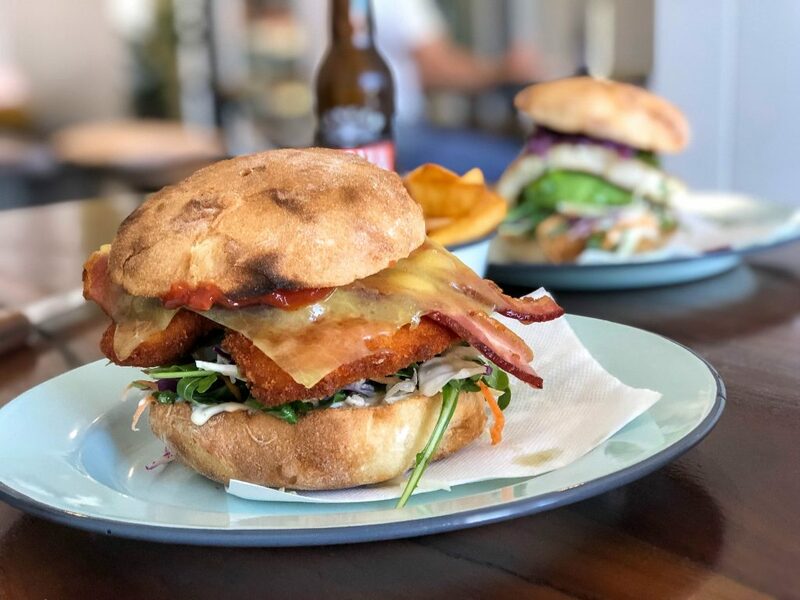 Old Maids Burger Store, on Tweed Street in Brunswick Heads, is the former KC’s Food Bar which held the coveted title of ‘the best burgers in Bruns’. (Not sure if the gong was self-awarded or not!) 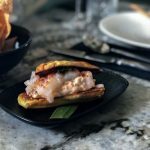 After a refresh that is very much in keeping with the old corner burger store, Old Maids has staked a claim on the best burgers in Bruns title, and I think it’s living up to the reputation. 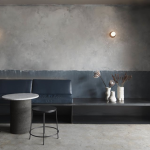 Old Maids is open seven days from 7.30am – 9.00pm and serves breakfast, lunch and dinner. 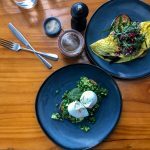 Like so many great food businesses in the area, they use plenty of locally sourced ingredients across the menu. 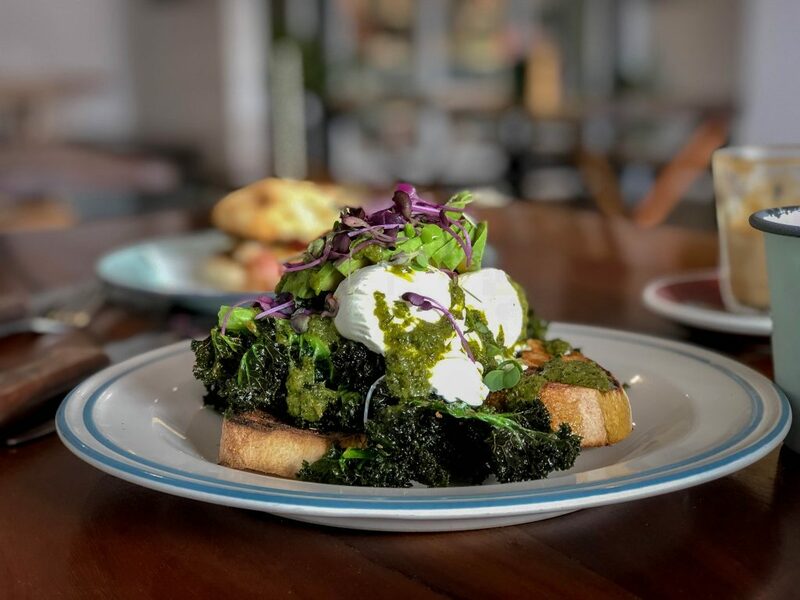 Breakfast is served from 7.30am – 11.30am and includes smaller options like House made peanut butter, banana and honey on sourdough or egg options like the Green Eggs (pictured) featuring poached eggs, avocado, crispy kale and chimichurri on sourdough or breakfast burgers like the Uncle Dutchy with free range bacon, egg, hash brown avocado, lettuce, tomato house made mayo and relish. (The Breakfast Burgers are available all day.) Then there are simple smoothie bowls for a sweeter, fruitier option. The lunch and dinner menu at Old Maids is all about burgers! Oh – and hot chips – but I’ll get to them later. It’s hard to choose from the burger menu which is definitely worth working through. 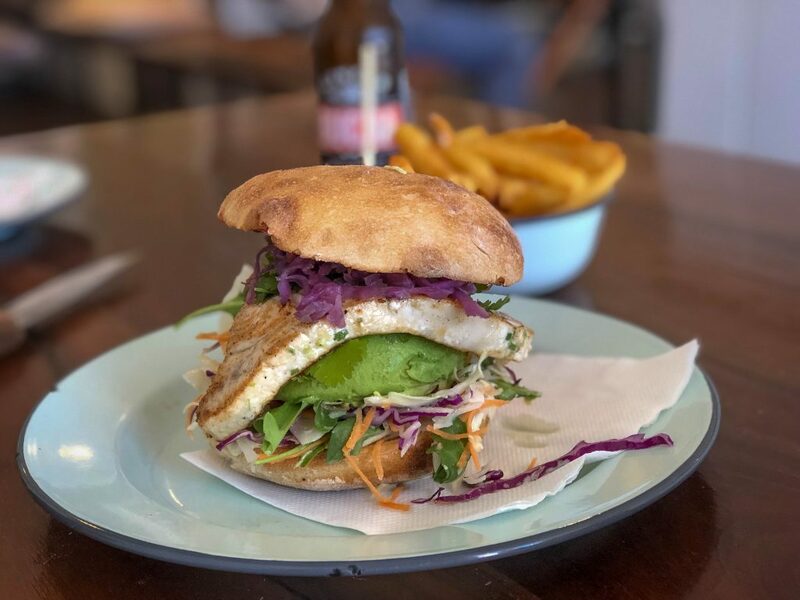 I am pretty keen on the Fighting Fish which features local grilled fish served on a bun with slaw, kimchi, coriander, avocado, house made tartare and chilli sauce. Mr GFAF has a soft spot for the Snitler, which is a chicken schnitzel burger with bacon, cheese, slaw, pickles, house made mayo and relish. There are vegan burger options like the Yam, I Am featuring a sweet potato and black bean patty with coriander, avocado, slaw, house made mayo, chipotle and chilli sauce. There are gluten free buns available as well. As for the hot chips. You absolutely must order some. They are up there with the best hot chips in the shire (my other favourites are from Bang Burger Bar in Bangalow). Just trust me on this one. I haven’t tried the Sweet Potato version as I can’t get past the classic ones! A tip: order a half serve if there are two of you. The chips – like the burgers – are very generous. For the tin lids there are little burger options and of course – hot chips! For drinks there are plenty of options from the fridge as well as made to order smoothies and old school Milkshakes. Padre coffee and Byron Bay Teas are served. So, who’s hungry? 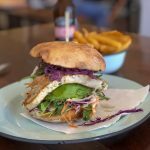 Time to enjoy some of this new season salty air in Bruns with a visit to Old Maids Burger Store for some beach holiday vibes and eats. 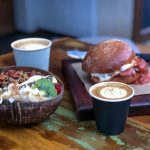 You can dine in their cute booths inside or outside under beach umbrellas or you can even takeaway to enjoy ‘the best burgers in Bruns’ as a picnic.